Yup. It’s another one of those write-ups. 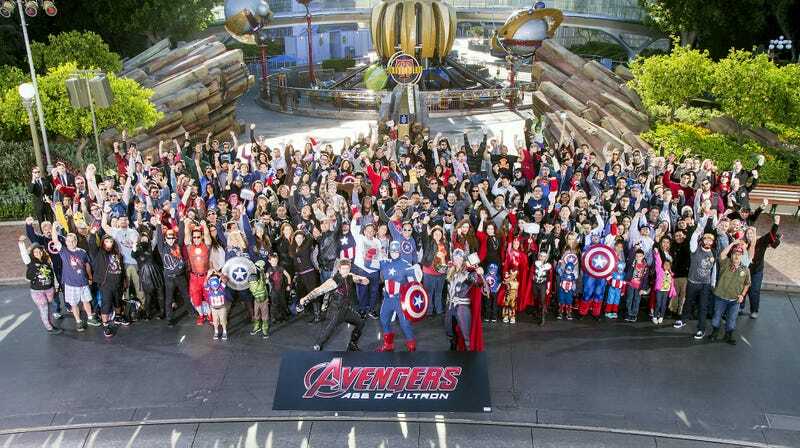 This time, I went to watch what is likely going to be the biggest blockbuster of the year, Avengers: Age of Ultron, at Disneyland before it opens in North America. Fret not, for I shall refrain from revealing anything about the movie itself. Attending this event was a bit tricky because unlike the other events, it started very early in the morning on Monday. Mondays are usually the busiest day for me, but thankfully, I was able to take the morning off. Long before sunrise, a friend and I drove to Disneyland AKA The Happiest Place on Earth™ to find that a sizable group of fans had already lined up at the front of the park with a TV crew standing nearby. A local news weather man, Garth Kemp, had come to spotlight the advance screening of Age of Ultron to get the TV viewers excited for the movie. It so happens that he works for the local ABC station, which is owned by Disney. Numerous people had come in costumes although most of us had opted to wear a superhero tee instead. I suppose my comicbook Hawkeye tee could count as a costume since that’s what the comicbook Hawkeye wears, but out of hundreds of people at the event, only one person recognized my shirt. Oh well. We had a Loki, a mini-Hawkeye and his mom as Black Widow, a mini-Scarlet Witch, a mini-Hulk, a couple of mini-Caps, a lady Cap, a lady Bucky, a lazy Nick Fury, and a bunch of people in plastic Iron Man helmets. Those who dressed up got to be on TV, which is fun. After breakfast, fans lined up to take a group photo commemorating the event. Hilariously, the group actually split into two: one with people who wanted to be in the photo and one with people who wanted to make a quick dash to the theater before anyone else. I’m proud to say that I am indeed in the top picture, although I’m not going to tell you where I am. Notice how there’s a Tomorrowland sign in the background? Disney loves corporate synergies. Once the picture taking had finished, all hell broke loose. For, you see, the organizers never had at any point actually tried to organize the group. As far as everyone was concerned, the screening was a first-come, first-served kind of a deal, and there was a possible chance that people were going to be left without a seat in the theater. Worse yet, because the movie theater was actually far away from the breakfast location, there was a 15 minute walk during which people were trying their best to edge out to the front, leaving their friends and family behind while trying their best to not to trip on tram tracks on the street. It must have been a quite a sight to see: a stampede of rabid Marvel fans marching through Downtown Disney. I’m sure we gave other visitors quite a scare. Fortunately, everyone managed to fit into the IMAX-lite theater just fine, where the staff treated us to a free drink and a bag of popcorn. The movie started a bit late than scheduled at 8:20AM, but there no one complained. And how could they? They were about to watch the biggest movie of the year next to hundreds of like-minded fans who shared their passion. The advance screening event was exhausting, to say the least, but I wouldn’t have missed it for the world. Sign me up for the Ant-Man screening! As for the movie itself, you can read about it in the spoiler-filled megathread right here.